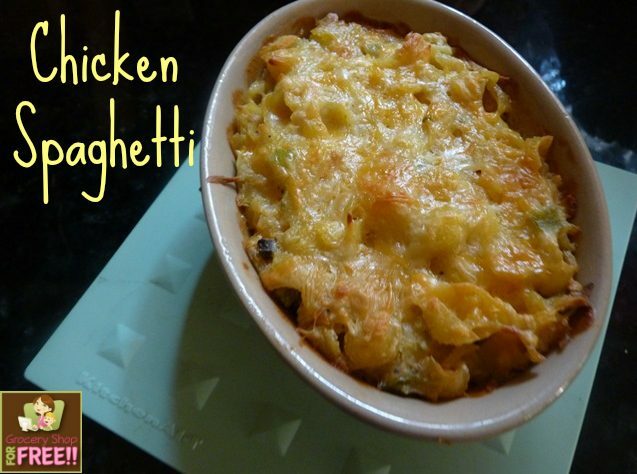 You are here: Home / Recipes / Dinner / Chicken Spaghetti! 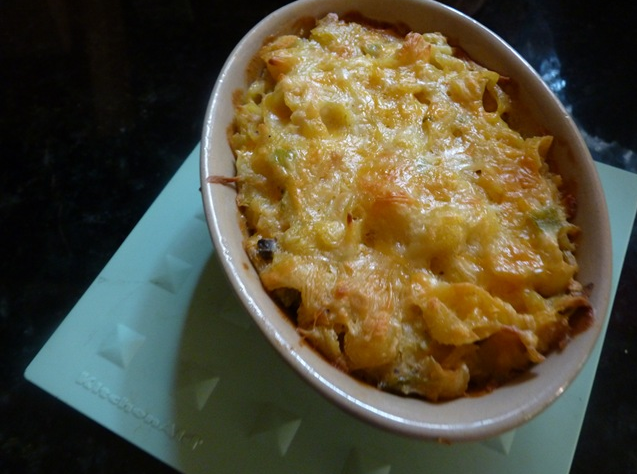 Susan is back again with another great recipe! This time: Chicken Spaghetti! 1st—you can use a whole chicken, if you don’t mind de-boning the chicken and if dark meat is acceptable. This an inexpensive way to go. If this is the case, you will boil the chicken in water for about 20 min per pound. Let the chicken cool and take as much meat off the bone as possible to use in this casserole. Catch the liquid by using a strainer to get all the bits out and freeze the chicken broth for another day. 2nd—if you can afford it and are in a hurry, buy a rotisserie chicken already cooked and de-bone it. 3rd—-if you are like my oldest two daughters, you might prefer to just use white meat. If this is the case, use about 4 or 5 large boneless chicken breasts and boil them or cook them in a skillet until done. 4th—this is my option tonight….canned chicken. I happened to have cans of Hormel Chicken that I bought on sale 10 for$10 a couple of months ago from Kroger. I am not in the mood to cook a chicken so, I popped open two small cans. Easy and cheap! For the recipe above, use 4 small cans. Cook the spaghetti according to the package directions. Use whole wheat, if you prefer. 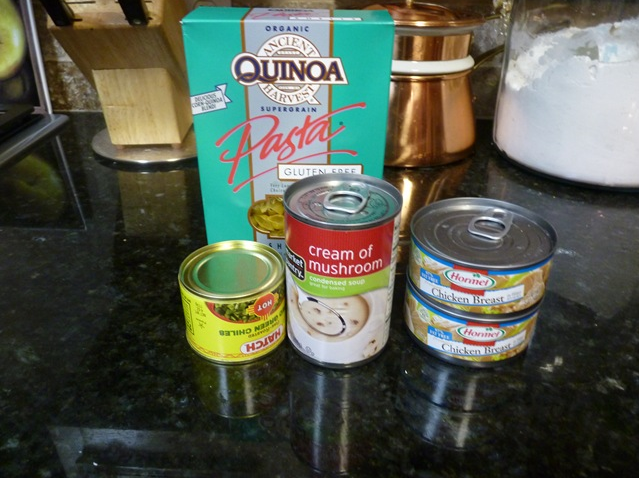 I don’t have any spaghetti tonight so I am using quinoa pasta….wheat free for gluten sensitivity. My oldest daughter has Celiacs and can’t eat any gluten at all…..ever…so I keep gluten-free pasta on hand. Mix all the ingredients together, including the cheese. The cheese will melt and stick all the ingredients together along with the soup. Use the milk to get all the soup out of the cans. You can reserve a little of the cheese to top it for a nice appearance, if you want. Divide this into two square pans. Cook one at 350 degrees for 30 minutes. Freeze the other before you cook it. Or, of course, if you have a bigger family, it makes one 9×13 pan. Serve it with a green vegetable, such as green beans or a salad. I am alone today and made a small little pan just for me. I only made a half batch but there was enough to freeze a square pan for later. As soon as you said “freezes beautifully section of the cookbook” I knew what movie and could hear it perfectly in my head. I am saving this to go on my menu for next month. Thanks for sharing! @Venessa: Great thanks! I LOVE that movie, too! Sounds excellent! Will be bookmarking this one! Thanks for sharing! @Shelly @ Coupon Teacher: Thanks and thanks for the linky!